He used to be a daredevil on a motorcycle. Now he favors his bad left leg, and he’s chiefly a teller of tall tales, most of all his own – that he and all the Byron men were born with hair on their chests, that they were born with all 32 teeth, that they were born talking. Could be that last tale is true because Johnny Byron does not shut up – not to the county bureaucrats who are trying to evict him from his derelict trailer in the woods, not to the alcoholic professor and the henpecked barkeep who see his place as a respite, not to the changing horde of teenagers who come to Rooster to buy drugs and to escape from everyday life. Just how you look at Rooster changes minute by minute in Jez Butterworth’s provocative play Jerusalem, whose title – echoing a beloved English hymn that puts forth the scepter’d isle as a possible heaven on earth – suggests that Johnny Byron’s sense of his homestead is wishful thinking more than anything else. But your ideas about Johnny are also colored by the remarkable performance of Mark Rylance, who won the Tony for best actor in a play for this role Sunday night, and whose driving, charismatic and inexhaustible performance makes you think, for just a moment, that Rooster’s views of his world may just be right. The setting (by the wizardly costume and set designer known as Ultz) is a clearing in the woods, where a battered Airstream trailer is surrounded by discards – an old tire, a crappy-looking loveseat, a disco ball hanging from a tree. There Johnny Byron has lived for 29 years, dispensing drugs to local teenagers and watching them grow up and drift away. 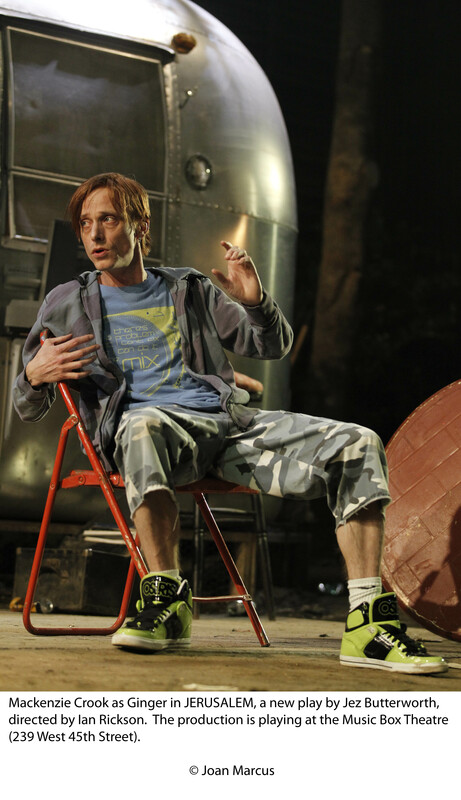 Mackenzie Crook as Ginger in 'Jerusalem.' Photo by Joan Marcus. The local authorities are none too pleased about all of that, however, and they’re set to throw Johnny out and put a 72-house subdivision in his place. That is, if they can stop the partying, drive off Johnny’s “band of educationally subnormal outcasts” and his stalwart lieutenant Ginger, and force Johnny to listen to sense. Butterworth, a much-praised English playwright, has built Jerusalem with layer upon layer: It helps to know about St. George’s Day and William Blake, about the anthem “Jerusalem” and the fact that, from Flintock, Stonehenge lies just down the road. But he’s also created a sad, hilariously funny and ultimately moving portrait of an indomitable man (and perhaps an indomitable country) who keeps rising to the occasion no matter what. 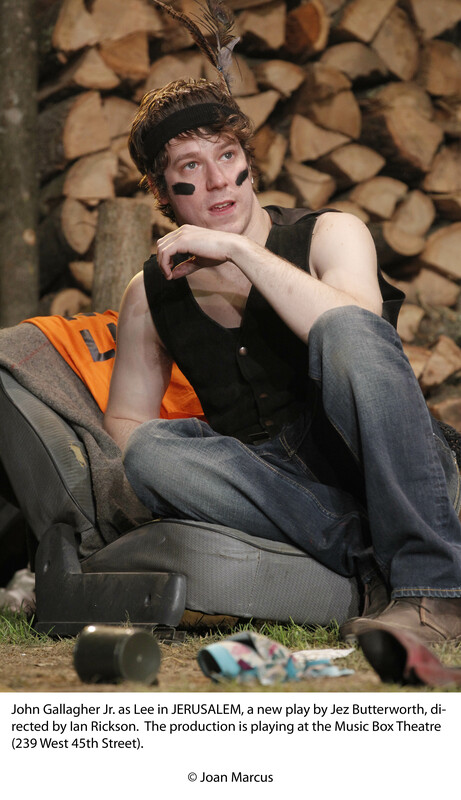 John Gallagher Jr. as Lee in 'Jerusalem.' Photo by Joan Marcus. Rylance is a wonder, and he’s supported by a fine cast: Mackenzie Crook is especially good as the sad-sack contrarian Ginger and Alan David as the Professor, oblivious but canny all the while. These losers are all remarkably articulate (the males among them, anyway – Butterworth has given less weight to the few female characters): John Gallagher Jr. (American Idiot, Spring Awakening) makes an appealing boy named Lee, who’s about to flee England entirely, and Danny Kirrane is funny and affecting as Davey, an underachiever who knows his limits. Where: The Music Box, 239 W. 45th St., New York City. When: 7 p.m. Tuesdays, Thursdays and Fridays; 2 and 8 p.m. Wednesdays and Saturdays; 3 p.m. Sundays, through Aug. 21. Running time: Three hours, with one intermission after Act I and one short break between Acts II and III. This entry was posted in Broadway, New York theater, Reviews, Uncategorized and tagged Alan David, Jerusalem, Jez Butterworth, John Gallagher Jr, Mackenzie Crook, Mark Rylance, New York City, William Blake. Bookmark the permalink. 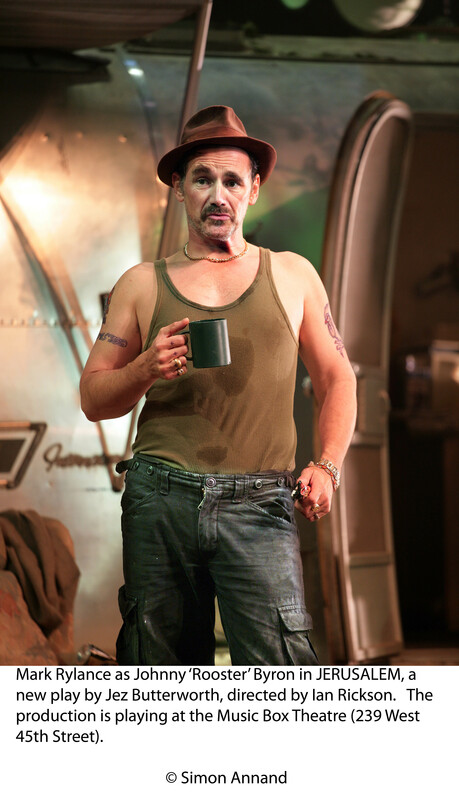 I saw Jerusalem last Saturday and although I didn’t really understand what Jez Butterworth’s point was I thought that it was worth watching for the Rylance performance and for the humor. what’s the point. Nobody will admit that they don’t understand it he said and I sort of agreed with him.It’s not Checkov I thought. Why such a large cast when some actors had nothing to say. I thought that it needed a dramaturge to find the conflict and increase the emotional connection. But then it was a hit in London and New York. I had to admit that I hadn’t been bored at all during the performance. the passion (beating his drum). The title explains the play. Although it is set in modern England it could be set anywhere and at any time. Even in Palestine two thousand years ago. Rooster tells stories. These stories are repeated and new stories are told creating the myths whichmay or may not be true. Christ of two thousand years ago to the image that Christians have today. the characters. None of them like each other. They have no connection. Rooster feels connected to his forefathers and to his son but it is a connection ofblood not a personal connection. We instinctively know that we are alone andthat we will die alone. Lee can change his name and emigrate but he will still be thesame person and he will still be alone. That is a problem for existential theater but I think this play does a good job of overcoming it.